A Sudanese registered plane, a Boeing 707 aircraft, carrying general cargo, bound for Khartoum, crashed two minutes after take-off from Sharjah Airport. Six people were killed. A Biman Bangladesh Airlines Airbus A310-300 was sent skidding along the runway of Dubai International Airport after its undercarriage collapses as it was accelerating to take off. 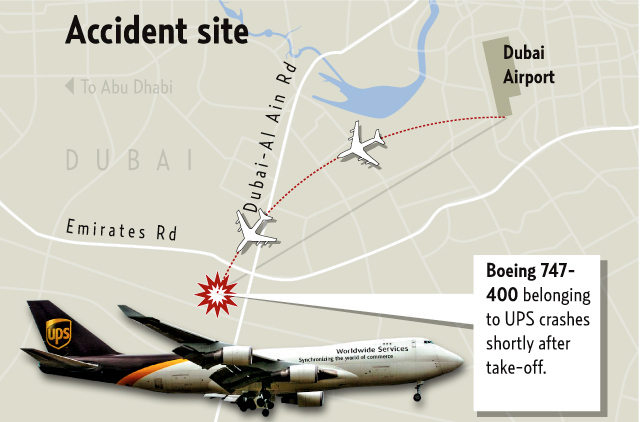 The aircraft came to rest at the end of the runway and was evacuated, 14 people were injured. A Kish Airlines flight crashed near Sharjah International Airport, killing 43 of 46 people aboard the aircraft. The twin-engined Fokker 50 aircraft, crashed at the Sharjah-Ajman border in Al Ramaqiah residential areas. The flight was coming from Kish Island, and was on a 'visa change' run. A Pakistan International Airlines (PIA) flight with 205 people on board crash-landed at Dubai International Airport when part of its landing gear collapsed. The aircraft skidded along the ground and eventually came to rest in sand 50 metres from the runway. Nobody was seriously injured. An Aeroflot flight from Moscow to Dubai with 307 passengers and 15 crew on board 'belly-landed' at Dubai International Airport, causing two of the engines on the Ilyushin 86 aircraft to burst into flames. Nobody was seriously injured. Eighty five people were killed after a Tajik Air charter flight Tupolev Tu-154 crashed near the Sharjah International Airport. Only one person survived the crash. The flight was coming in to Sharjah from Khoujand in Tajikistan. An Abu Dhabi-bound Gulf Air Boeing 737 coming from Karachi crashed in the desert between Al Ain and Dubai killing all 112 passengers and crew.